The new chief of Duke’s Memory Disorders Division (MDD) is working to develop an improved clinical care model to better serve families and caregivers while focusing on research for patients diagnosed with dementia. 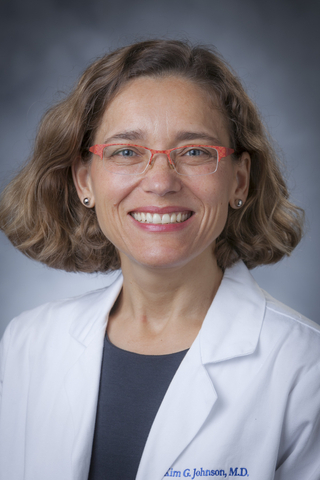 Kim G. Johnson, MD, an assistant professor in the Departments of Neurology and Psychiatry and Behavioral Sciences at Duke, was named chief of the Memory Disorder Division in December 2018. Long-time division leader James R. Burke, MD, PhD, a neurologist, is retiring from clinical work but will continue research activities. Johnson, who brings experience in both neurology and psychiatry to the new position, outlines her initial steps to improve care for patients with cognitive disorders encountered in the clinic. As the first MDD leader with clinical experience in both neurology and psychiatry, what do you see as the greatest challenges facing the clinic? The biggest challenge we have is increasing access to the clinic for patients and providing the breadth of services needed in the most efficient manner. There is a growth in the number of patients and families who need memory care services as the population ages. Estimates suggest that 5.8 million people in the United States will be diagnosed with dementia by 2020, increasing to 8.4 million by 2030. The treatment of memory disorders is multidisciplinary, involving neurobehavioral medicine, neuropsychiatric care, and even internal medicine at times. We want to reach more patients experiencing cognitive loss by reviewing our clinical approach and aligning our services to provide the most efficient and effective care. We are investigating new clinical care models that will allow us to see and treat more patients while also providing more education and services. Education regarding cognitive loss and behavioral symptoms as well as helping patients and families understand the disease is an important part of our care. A dementia diagnosis is daunting, and we know that appointments provide an opportunity for patients and families to process and understand what is going on. The diagnosis offers a starting point. Our key is working in a team model to provide social work services as well as speech and occupational and physical therapy. Offering research as an option is another way to provide better support for patients and families. Is dementia the most common presentation for the MDD? Dementia is a significant diagnosis in this clinic, but we also help patients who are experiencing cognitive decline that occurs with normal aging and mild cognitive impairment, which can stem from many causes. Regarding dementia, we determine the type of dementia and recommend medications and treatments that can slow progress, such as speech and occupational therapy. The underlying mechanisms behind dementia remain unknown. As a result, it is important to offer research options. We find it is meaningful to patients to get patients involved in research studies the day of a diagnosis if possible. The Alzheimer’s Disease Research Center offers clinical trials for future medications and many other studies that are exploring novel approaches to understanding and diagnosing dementia, including using a blood test or new imaging techniques. One exciting project is looking for signs of neurodegenerative disease in the microvasculature of the retina. What defines a typical patient referred to MDD? Memory loss is evident in the lives of many patients, and particularly among the older patients in our clinic. We see several types of neurodegenerative conditions, including Alzheimer’s Disease, frontotemporal lobar disease, Lewy body dementia, and vascular dementia. Our team encounters many other causes that could be contributors, including medication side effects unique to patients over age 65, chronic health conditions, mood disorders and anxiety, sleep apnea, and vitamin deficiencies. The majority of our patients are over age 65 and present with some type of neurodegenerative process. We perform an initial evaluation to diagnose the disorder, identify services needed by the patient and family. We work together as an integrated team to deliver the best care we can based on what we know about memory disorders at this time.